Our range of products include wire feeder and copper sulphate for mig wire. 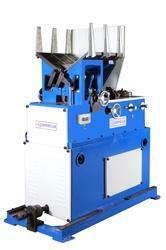 We are a counted firm engaged in offering a fine range of Vertical Wire Feeder to the respected patrons. These offered machines are manufactured by making use of optimum grade raw material along with sophisticated technology and machinery. developed machines and technology. In addition to this, the offered products are manufactured as per the clients needs and requirements meeting the international standards and can be availed at affordable prices. We are the leading manufacturers and suppliers of Copper Sulphate for MIG Wire.